Steamboat Springs, Colorado is one of those big, small towns filled with local flavor. You won’t find many big chain restaurants here, which is all the better. 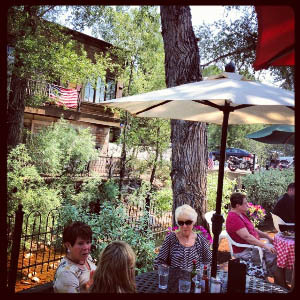 When visiting the Springs, it’s best to eat where the locals eat. Here’s a list of some of the local favorites and ours’ as well. Cruisers Sub Shop We were in search of a sandwich shop to pick up a picnic lunch to take with us to Fish Creek Falls when we happened across Cruisers. They take pride in their fresh, all-organic, toasted subs. After one bite, it was easy to taste why. So delicious and original, I’m craving one now. Name another sub shop where you can order a chicken salad sub that’s mixed with dried cranberries, pecans and apples? That’s what I thought. Sweetwater Grill It doesn’t get more family-friendly than this. 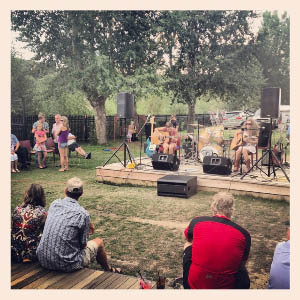 Located on the Yampa River, have dinner and cocktails on the deck, listen to live Bluegrass and watch your kids play on the playground a few yards away while you enjoy some adult conversation. Why haven’t more restaurants figured this out? Don’t know, but we’re glad the Sweetwater did. Their menu features everything from Banana Leaf Wrapped Wild Pacific Snapper to Chicken and Waffles. I had the Shrimp Carbonara served with a fried egg on top! Yes, just about anything tastes good with a fried egg on top. The Oasis Sundeck Okay, I have no idea if this is really where the locals eat, but I thought I’d sneak it in anyway because you just have to make the trip for the view! 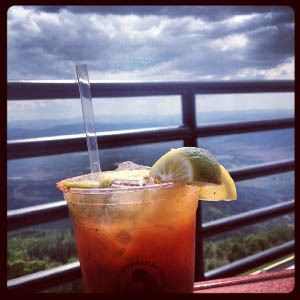 Located 9131’ up at the top of the gondola, take in the Yampa Valley 2000’ below from the Thunderhead sundeck. But, be sure to get there before 2:30 when the grill closes if you plan to have lunch! If you’re late, like we were, you can still enjoy some delicious cocktails until 4pm. Their Bloody Mary’s are a meal in themselves, and super spicy! The Shack Café Located downtown on the main drag, the Shack has been serving up breakfast and lunch since 1969! And they serve breakfast until close at 2pm. The Shack was super packed following Steamboat’s annual Independence Day Parade when we walked in, but we found 3 stools at the counter and saddled up for a late breakfast. I remember as a kid thinking sitting at the counter was the coolest, so it was fun to watch my own five-year-old relish in it too. 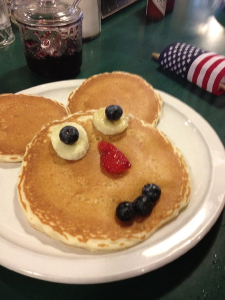 She even ordered for herself… Mickey Mouse pancakes please! What else? Freshies Fresh, wholesome food for breakfast, lunch and dinner is what you’ll find here. But, good luck finding a table – it seems everyone loves Freshies! 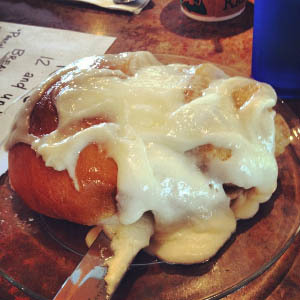 When you go, you MUST HAVE their ginormous, homemade, hot-buttered cinnamon roll. Easily, big enough for two, get it half price with their online coupon! So, what excuse do you have? The Creekside Café If ambience is what you’re after, you’ll find it at Creekside. Their picturesque patio and flower garden beside Soda Creek couldn’t be more perfect a location to enjoy their legendary eggs benedict, served 13 different ways. Or try their malted waffles served eight different ways. We stopped by for lunch and had a hard time deciding between their Black and Blue Burger and the Apple Spinach Salad with candied pecans. Considering all the eating I had done for the past three days, I decided to be a good girl and go with the salad. But next time, I’m going Black and Blue, baby! Here are more of the restaurants the locals recommend. We just didn’t have time to squeeze them all in! Disclosure: The City of Steamboat Springs hosted us for the purposes of writing this review. No other compensation was provided. All opinions expressed are my own and without influence by The City of Steamboat Springs. What! No Double Z? Best BBQ in the State.